Who exactly are the Beach Fossils? A Brooklyn trio whose eponymous debut released in 2010, Beach Fossils are but a fraction of the numerous beach-pop inspired bands that all seem to share hazily-delivered vocals and the habit of naming their bands after universally loved geographical landforms. It's certainly not a trend that deserves mocking, as we were delivered fantastic hits like Beach House's Teen Dream and Surfer Blood's Astro Coast, both of which took the critical world by storm in 2010. Other than being loved for its critical darlings, the genre's relaxing nature usually features a gentle balance between sustaining the catchy nature of the songs while keeping the smooth, dreamy qualities in place. It is a balance that Beach Fossils' new EP, What A Pleasure, could sustain if it was not for its struggle to remain interesting in the process. 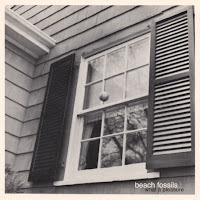 I realize the whole point of offering a release in this genre is to craft a cohesive piece that resonates that relaxed flow from all angles, but while Astro Coast and Teen Dream saw their respective creators willing to diversify and keep things interesting, Beach Fossils make a point to keep their audible environment so consistent that the songs often bleed into the next without enough nuances to even alert the listener of the change. It's a laid back approach that is as atmospheric in its vocal delivery and simple in its instrumentation as it needs to be, but simply cannot differentiate individual efforts enough to keep the hazy vibes from being soporific. Songs like "Face It" will give listeners a bass line (that really remains the most intricate and interesting instrument throughout the entire EP) and a chorus that livens up just enough to make it the most impressive piece and really the only one worthy of note. Between the simplistically delivered drum work and the deep grooves of the bass guitar throughout, it isn’t impossible to find traits to notice and become affectionate for in What A Pleasure's sound. It's just a shame that the likeable traits of Beach Fossils’ instrumentation cannot outperform the amount of tedium present in the vocal delivery and relatively bland guitar riffs. While it’s inappropriate to close the casket on Beach Fossils’ sound with all the potential laying underneath the dedication to this rising genre, it’s safe to say that What A Pleasure is an EP that, other than the bright qualities of the perky “Face It” and even the lazily, yet lovable “Fall Right In,” just won’t hold listeners attention long enough to remain relevant once summer arrives.